Albert Du Bouchet committed suicide in Spain on Apri 4, 2012. UPDATED, March 22, 2011 — The Catholic Church announced today that Alberto Du Bouchet would be released and expelled to Spain. 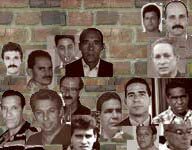 Alberto Santiago Du Bouchet is the fourth independent journalist to be imprisoned in Cuba since July 2006, when Raul Castro stepped in for his brother as president of Cuba, according to Reporters Without Borders (RSF). Raul has a ways to go before he catches up with big brother Fidel, who was fully in charge when the other some two dozen journalists in the gulag were imprisoned. But it really is a distinction without a difference, as Raul as been a full partner in the family business for more than 50 years. Du Bouchet, head of the Noticia Habana Press agency, last week was sentenced to 3 years in prison after he was convicted "disrespect," one of the Orwellian catch-all "crimes" the dictatorship uses to try to silence and punish those who oppose it. He had been arrested in April after getting into a dispute with a policeman, according to RSF. I guess charging Du Bouchet with being a "pre-criminal social danger" wasn't an option since at least in the eyes of the Castro regime, he had already proven himself as a "criminal social danger." From August 2005 to August 2006, Du Bouchet was imprisoned after he was convicted of "resistance." It is no surprise that the Castro dictatorship targets journalists. In Cuba, independent journalists - many of whom double as librarians or human rights activists - are on the front lines of the struggle for a better, for a freer Cuba. And they are on the front lines of efforts to break the embargo on information the dictatorship has placed on the Cuban people. As such, they are a danger, "pre-criminal" or otherwise, to a regime that they never will be able to respect.